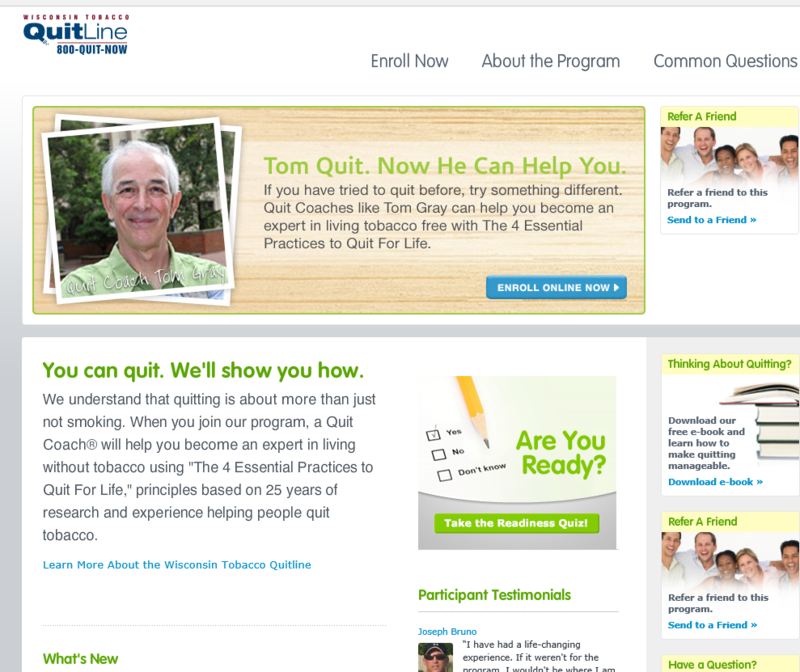 The Wisconsin Tobacco Quit Line is now offering free web enrollment as a part of its services, thanks to several recent enhancements to the Quit Line in December. Under the new enhancements, users are able to access the Quit Line’s Web Coach immediately upon enrollment completion instead of having to make an initial phone call. Existing Web Coach features are still available, including the popular discussion forums, video library, progress trackers and interactive exercises. Under the new enhancements to the Wisconsin Tobacco Quit Line, users are able to access the Quit Line’s Web Coach immediately upon enrollment completion instead of having to make an initial phone call. Enhancements include a new modern look and feel, better interaction capabilities between coach and participant, improved online mediation support, and secure email and messaging capabilities. Each section of the online platform also received upgrades to make the site accessible on mobile devices. “This could potentially bring in new tobacco users ready to make a quit attempt who would not ordinarily call the Quit Line to initiate services,” Wisconsin Tobacco Quit Line Coordinator Kate Kobinsky said. Kobinsky said 55 users registered via web enrollment in January, a sign that the enhanced Quit Line is already beginning to reach new people. The enhancements also collect participant contact information up front, allowing quit coaches to reach out to participants who do not initially complete the full enrollment process. The Quit Line is funded by the Wisconsin Department of Health Services. “We appreciate their ongoing support,” Kobinsky said. To get FREE services from the Quit Line, call 800-QUIT-NOW (800-784-8669) or enroll online.